An estimated 2 million cat videos have been shared to YouTube since the site launched nearly a decade ago, garnering a combined 24.6 billion views, making them one of the most popular types of content on the internet today. But of course, this all had to start somewhere. 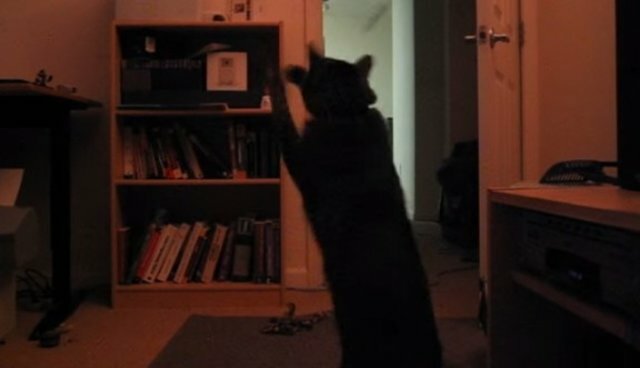 On May 22, 2005, YouTube co-founder Steve Chen became the first person ever to upload a cat video onto the site - this 30-second clip of his pet playing with a rope, titled "Pajamas and Nick Drake." The first cat video to reach viral status on YouTube was uploaded a year later, in May of 2006. The short clip titled "Puppy vs. Cat", posted by user Sanchey, has all the elements one might expect from a great cat video: a cute kitty (of course) showing grace in the face of adorable adversity, which in this case, happens to be a bunch of curious puppies. The Dodo recently reached out to Sanchey, a.k.a. Michael Wienzek, to find out what it's like to hold the distinction of having the first viral cat video on what is now the world's largest database of viral feline footage. Turns out, he had no idea what a pioneer he was. Wienzek, who says he doesn't really use YouTube anymore, seemed genuinely surprised to learn that the clip he'd uploaded all those years ago has been seen well over 16 million times. "It's just a lot of puppies, and one cat," he says. "I guess people like cat videos." And indeed they do. Not only are cat videos among the most viewed videos on YouTube, they've become a staple part of popular culture in the real world as well. So much so, in fact, some feline stars have even gone on to become household names. But cat videos actually pre-date the internet by more than a century. Here's what is believed to be the first ever film of cats, recorded in 1894 by another cat video pioneer, Thomas Edison. "Cats appear to perform oblivious to the camera. That seems quite a contrast to other similar videos online. Especially other 'cute' videos ...things like videos of babies and dogs," says O'Meara, a lecturer in Media Studies. In other words, it's because cats are so blasé that we can't turn away.